Andy: English Harbor has a real harsh bit up front and it tastes a little bitter and a little like burnt campfire marshmallows. It’s a lot better mixed with the Diet Coke as the bitterness is completely gone. It’s not bad, but I probably won’t buy again. Adrian: The bottle this rum comes in kind of bothers me. 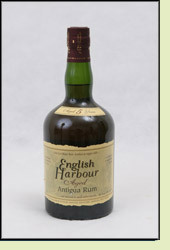 The bottle is dark and green which masks the true color of the rum, and makes this rum kind of deceiving. It makes you think the rum is darker and richer than it is. The rum actually tastes a little bitter, so I’m not a fan of it straight. Fortunately mixing with Diet Coke kills the bitterness and keeps a nice strong rum flavor.